Located just 500 miles south of Miami (an hour's flight) in the Caribbean Sea, the Cayman Islands, a British Overseas Territory, remain one of the best-kept secrets in the region. The Caymanian people are friendly and speak English. There is racial and social harmony and little crime - in fact, the police don't even carry guns. The standard of living is one of the highest in the world, and the islands rank in the top ten largest financial centers in the world, with the likes of Hong Kong, Tokyo, London, and New York. As a place to vacation or establish either a primary or secondary residence, there are few, if any, venues as inviting as the Cayman Islands. The waters surrounding these islands are calm and clear. The fishing and diving are among the finest on the planet, and the population of approximately 40,000 (about half of them "expatriates") is well educated, well traveled, and sophisticated. Utilities on all three islands are world-class, including telecommunications and access to the Internet, reliable electrical power, and an abundance of potable water. The islands historically have been known as a "tax haven," since Government imposes no direct taxes on individuals or corporations resident here. In other words, there are no payroll taxes, inheritance taxes, capital gains taxes, or property taxes. However, all new residents are advised to seek advice from counsel in their countries of origin to be certain they comply with all national laws and financial regulations. 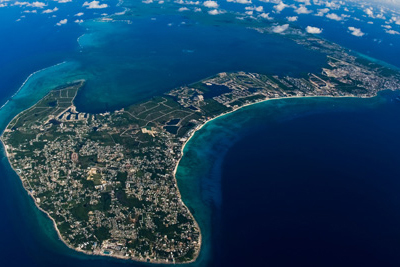 Grand Cayman, by far, is the largest of the three islands that collectively make up the Cayman Islands. Approximately 38,500 people reside in this modern tropical metropolis, driving more than their fair share of Mercedes, BMWs, and other luxury automobiles. This island itself is comprised of five districts, each with its own personality and attractions. 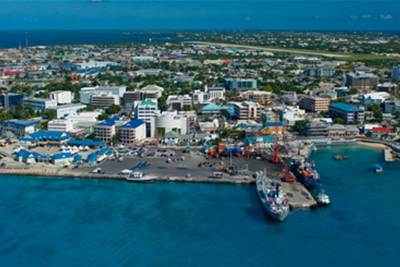 The capital of the country is George Town, which is the commercial and governmental center of the island. The downtown area includes the cruise ship port, fine duty-free retail establishments, the Legislative Assembly building, and the Courthouse. The pace of life in the outlying districts is distinctly more relaxed. The island's most popular tourist attraction, the Turtle Farm, is located in the District of West Bay. The District of Bodden Town, once the capital of the country, is home to Pedro St. James (known locally as Pedro's Castle), the birthplace of democracy in these islands. The district of East End offers an "old-timey" view of the Cayman Islands - it could practically be a movie set - as well as beautiful panoramic views of the sea from the coastline road. The District of North Side includes the community of Cayman Kai where multimillion dollar homes - many owned by expatriates who use them only a few weeks a year - are in abundance. Also, "Rum Point," considered by many to be the most picturesque part of the island, is also at the tip of North Side. The setting includes undulating palm and Casuarina trees, a beautiful beach with watersports facilities, and a couple fine restaurants. Cayman Brac and Little Cayman (also known as the "Sister Islands") are located approximately 80 miles to the northeast and are, well, much more "island."